The cold weather we have had has put the bees into tighter clusters. With the contracting of the cluster of bees, there will probably be some brood mortality in some colonies. The earlier warm weather, let the bees expand their brood areas. Now with the colder weather, the bees may not be able to cover all the brood that the queen had laid. This uncovered brood will more than likely get chilled and die. Don't be surprised if you start seeing dead brood and or bees in front of the hive when the temperatures warm up. This will set the hive back a little but it won't hurt them in the long term. Walk away splits should not be done in this cooler weather. The cool weather may chill the brood that the covering bees have been shaken off of. A large number of brood could perish during the time it takes for the bees to reoccupy the split that has no bees covering and protecting the brood. Stick with a traditional split and there will be no problems. The fruit bloom and the dandelion bloom has begun across the metro area. Traveling to the south metro I saw many dandelions and flowering shrubs and crabs starting to bloom. My Wild Plums are just starting to show some life. But in St Paul Wild Plums were in full bloom. This current bloom will last around three weeks with Apple trees coming in around May 10 or so. This bloom is about a week earlier than normal. This is ice cream time for the bees. Wide spread nectar and quality pollen. If the weather is good the bees win, if the weather is cool and rainy the bees may miss some of the ice cream. Pollen patties should still be on colonies during this cool and rainy times. The bees are not able to forage right now and for much of the next week. 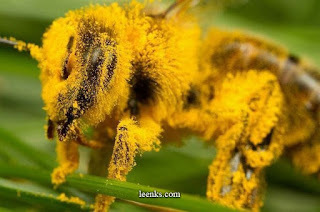 Pollen is needed now because the hive is still moving forward in spite of the weather and beekeepers need to keep pollen available or the hive population may suffer. Strong overwintered colonies should have honey supers on NOW. Honey supers go on two at a time. It is not uncommon for strong colonies to get a super or two of honey during this time if the weather accommodates. When this weather warms up a little, swarm control should be used on strong overwintered colonies. Many of the strong colonies are bursting with bees. Some warm weather may get swarm cells going in the hives. Divides are going on now and into the month of May. If you do not divide a strong colony, the bees will divide themselves, they WILL swarm. If you don't want to run more colonies, Nature's Nectar LLC does buy divides. The queens have arrived. I have a little prep to do. But I should be ready to sell by 12:30. Limit on queens this week: 3 queens per car. Nature's Nectar LLC will be closed Saturday May 6th to May 9th. Open on Wed May 10th. Plan your queen purchases accordingly. Sugar water in the top cells, pollen is the yellow in the cells, eggs are in the lower cells. The beekeepers that purchased 3 lb packages should have a laying queen by Wednesday. Even though the weather is cool, you still need to check the hive for eggs. If you see eggs you know the queen has been accepted. If you don't see eggs and larvae in your hive, you may need a queen. While you are checking, you do not need to see the queen. If you see eggs then you are good. Close up the hive. 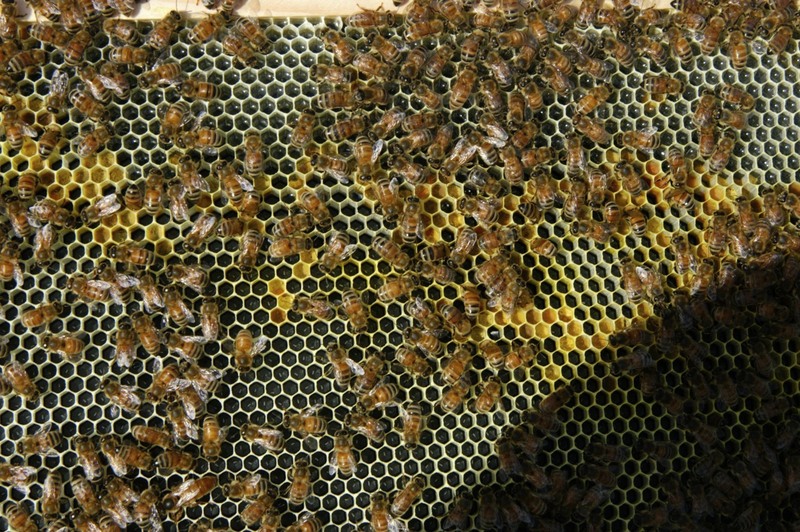 Failure to check for queen acceptance may jeopardize the survival of the colony. A divide is when a strong overwintered colony is split into two hives. If strong overwintered colonies are not split, the hive will more than likely swarm. If the hive swarms, that colony will probably not yield an excess honey crop. A divide can happen when a colony has eight frames of brood and bees. If you do not have that much brood yet, wait a week and check again. Make sure a queen is available when the divide is ready for a queen. Divide eight frames of brood between two boxes on the hive. Brood is, frames containing eggs, larvae and capped brood. I like to mix up the brood types in the divide. This assures getting bees of all ages on the split frames. Put a queen excluder between the two boxes of brood. Wait four full days. After four full days, go into the hive and inspect the boxes where the brood frames have been placed. You are looking for eggs. Whichever box with the brood has eggs, then that is where your existing queen is. Leave the box with eggs called the Parent, and takeaway the other box. Put honey supers on the parent. Put the removed box with brood, called the divide, by itself in the bee yard. Put a feeder pail on the divide. There is better queen acceptance during a nectar flow. Approximately 24 hours later install the new queen using the slow release method, using a hard candy plug. Seven days later, check the divide for eggs. If it has eggs, the queen has been accepted. Now the divide is in a single box. It will remain this way for around a two weeks when another brood box is added. 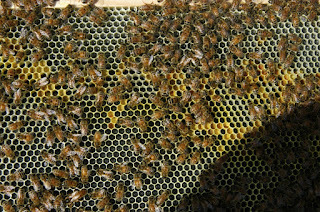 Add honey supers before the nectar flow starts, usually around mid June. Marked Saskatraz Queen on a frame of QuickDraw foundation. Notice the eggs in the open cells at the top of the pic. I will be getting queens starting next week and will be getting weekly shipment of queens for the next month. Please call or email to reserve a queen(s). I will be getting 300 queens to start. There will be a 3 - queen limit the first week of queens. Queens will only be available to my current customers. If you are not in my customer list or no longer buy your bees from me, try Olivarez Honey Bees or Big Island Queens for queens. Pollen clings to the hair of a honeybee. The pollen is dry. The bees will regurgitate nectar from their honey stomach, then rake their legs over their body. The nectar will get mixed into the dry pollen. As the bees groom themselves, they rake the now moist pollen into a pellet and it is attached to their pollen baskets on their rear legs. There is pollen coming in right now. Hives are limited on collecting pollen by cool temperatures and rain. If it is cool in the early part of the day, sometimes pollen collection is limited to just a few hours a day. Rainy days keeps the bees in the hive. Strong colonies use quite a bit of pollen this time of year. Keeping pollen patties on through the month of May assures proper nutrition for the spring brood build up. By not providing the needed nutrition can hurt the overall quality of the bees. When bees don't get the proper pollen during their development, the resulting bee, can have a shorter life spans and their glands may not develop properly. I always keep a pollen patty on my hives. As the calendar moves into May, a half a pollen patty sits on the top bars of my hives. I check them weekly and replace as needed. The weather is always hard to predict but I want healthy bees as we move towards the June nectar flow. We do not want the plastic bee cages or the wooden queen cages back. Please recycle them. The plastic cages are a recycler number 5. Not all recycler's take number 5. Please stick to the pickup schedule below. The feeder cans are low on feed. You need install the bees right away, or spray the cage with syrup several times a day. Shake the package and listen for the slosh of syrup in the can. If you don't hear liquid sloshing around, then the feeder can is empty. Please Stick To The Pick Up Schedule Below. If everyone came at once there would be several hours wait to get your bees. With the schedule, everyone is spread out through the day, no one is here more than five minutes. If you live over 100 miles away come when you can. Sales tax is included in the pricing. We will not take credit or debit cards because we are working outside and will have no way to process the card. If you have never been here before, here are two videos of what the road looks like one mile from our house. I think the bees will be delivered sometime this weekend. I do not know when at this time. It all depends on when the truck leaves California and the weather along the route. The bee supplier is working in between rain storms loading up the package bee cages. I know this is Easter weekend and many people may be out of town. The pickup days will also go into early next week. But if you are around, watch for updates. I will be publishing a pickup schedule, giving you a time to pickup, going by the first initial of your last name. For this to work, I need you to pickup with the schedule. There are 800 beekeepers on this delivery and pickups needs to be spread out through the day. There should be solid pickup dates and a pickup schedule published by Friday. A week after installation the hive needs to be checked for queen acceptance. We are looking to see eggs in the newly drawn comb. If you don't see eggs after 7 days, check again after 10 full days from the time of putting the bees in. Failure to check for queen acceptance may put your colony in peril. If for some reason your queen was killed or was injured when installing the bees, you may be queenless and the hive will not survive without a queen. Double Click on the pic for a bigger view. You can see the white eggs in the back of the cells. The eggs are coming out straight at you. The yellow stuff in the cells is pollen. The glistening liquid at the top of the frame is nectar (sugar syrup). This is the video of the first inspection looking for eggs. If you want an email about the 3lb package bee delivery update you need to sign up for my email list. I cannot do it for you. At this time I still do not have a solid date on the arrival of the 3 lb packages. Today there is heavy rain in California and that may impact the delivery schedule slightly. We are still looking around the 18th. Although, at the moment there is no official date set. Please check the blog often to look for updates. If your overwintered colony is strong, it is time to do a reversal. Move the bottom box to the top. The reason we do reversals, is to get the queen to lay eggs throughout the whole hive. This also makes the bees put pollen and nectar in all the hive boxes. Now when you check your overwintered hive on a weekly schedule, and if there are eggs in the top box, do a reversal. This will expand the brood nest an the hive will get more bees in the hive. This is the goal as we approach dividing time around early to mid May. Do not do any more reversals after June 10th.